Romanian Sphinx -  An epic journey of new discovery so fantastic that our natural instinct would be to block it out. ​This book heralds the most remarkable archaeological find in the annals of Mankind. Unbeknownst to most, there is an ancient sphinx located in the Bucegi Mountains of Romania and near the border of the famous land known as Transylvania. ​In 2003, the Pentagon discovered, through the use of state-of-the-art satellite technology, an anomaly within the Bucegi Mountains. Through the highest levels of Freemasonry, the Pentagon was able to secure an alliance with the most secret department of the Romanian Intelligence Service which is known as Department Zero. Together, the Romanians and the Americans utilized the Pentagons secret technology to penetrate a chamber inside of the mountain that was otherwise inaccessible to humans. What was discovered eventually was a holographic Hall of Records left by an advanced civilization near three mysterious tunnels leading into the Inner Earth. 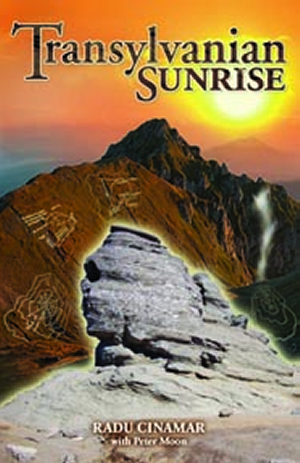 Transylvanian Sunrise chronicles the discovery of these modern day artifacts that represent the dawn of a new era for Mankind. Peter Moon is brought into the fold through his Romanian Publisher who just happens to be the publisher of this remarkable story. Peter, whose original connection to Romania came through Dr. David Anderson of the Time Travel Research Center, recognized that such satellite technology would had to have utilized Dr. Anderson's proprietary space-time technology for maintaining satellites in orbit and pursues the matter further. This leads Peter Moon on an adventurous journey to Romania to visit the Romanian Sphinx and a remarkable encounter with his old friend, Dr. David Anderson. When American diplomat was informed that Romania will send a press release World of crucial importance for humanity, everything was chaos. Nobody knew, but everyone suspected that something is very serious and important. The President was called for a direct phone conversation with the White House. Within hours they had been blocked all transactions and agreements with international financial organizations of the Romanian state. It is expected momentarily order declaring a state of emergency in the mountains and the capital. Talks between U.S. officials rushed to Bucharest and had arrived on the Romanian side were made without a translator. They were so violent that few have not been moments of crisis that diplomats were shouting at each other as much, proferand multiple threats of retaliation. Other countries in the world did not know anything of this problem, and the Americans know well that there are always some very powerful countries would be united with Romania to support immediate public statement. ​The statement had contained the main data discovery Bucegi Mountains, providing evidence to the world, photos and other elements essential for clarification. It would have been invited leading scientists to study and research. ​But most importantly it would have been revelations about the very distant past of humanity and real history that was almost entirely counterfeit. The Romanian Sphinx is a "rock formation" in the Bucegi Natural Park which is in the Bucegi Mountains of Romania. It is located at an altitude of 2,216 metres (7,270 ft), a 10-minute walk from the Babele. The first photo of the Great Bucegi Sphinx was probably taken in about the year 1900. This photograph was taken from a front position, not from a lateral one, as it usually appears in pictures nowadays. It only acquired its nickname, referring to the Great Sphinx of Giza, in the year 1936. ​The image of the sphinx appeared when the rock, having an 8 m height and a 12 m width, was watched from a certain angle. The megalith has its clearest outline on 21 November, at the time the sun goes down. Most travelers who come to Bucegi have heard about the Romanian Sphinx, a strange configuration of rock high on the mountain. Tourists are drawn to its human appearance: proportionate face, distinct lips, cheeks and large eyes beneath a wide forehead. The sight is a thrilling image for the imagination. It is believed the Sphinx, which stands 2,216 meters high, is a representation of the supreme divinity of an ancient people, the Pelasgi. They were a pre-Indo-European tribe who lived near the Aegean Sea, until the Greek tribes'migration up to Eland, Small Asia and Egypt. "The enormously colossal figure in the Dacian Carpathians transmits a sovereign expression of dignity and an immensity of power that could not possibly represent anyone else but the great, national god of the Pelasgian tribes, whom has been granted all the most imposing heights of the mountains," said historian N. Densusianu. Many historians believe the Egyptian Sphinx in Gizeh is a copy of the Sphinx on the Bucegi Platform because of its resemblance to Zeus. In support of this hypothesis, a resemblance has been acknowledged between the Bucegi Sphinx and a sculpture of Zeus, which was discovered in Italy and now is preserved at the Vatican. This bust presents Zeus's traits in a barbarous, severe figure, characteristic of the Thracians. Also the fact that both sphinxes measure the same height is curious, as is the fact that all Egyptian deities have human bodies and animal heads, except for the Great Egyptian Sphinx, which has a lion's body and a human head. Near the Romanian Sphinx on the Bucegi Platform, there also stands a group os stones known as "Babele", or Old Women. The rocks look like giant mushrooms. The three formations are each 3.5 meters high and the diameters of the pedestals vary between 2 and 4 meters. Two of the caps are square, but the top on the third is elliptical. To maintain their connection with the sphinx, they were nicknamed "The Cyclopean Altars from the Caraiman", and are devoted to Earth and sky, to sun and moon, and to Mars, the god of war and of agriculture. Their presence has produced many legends and theories. According to some researchers, the rocks were molded by water and wind and permanently maintained by the process of freezing and thawing. The alternation between grit stone and limestone in the platform also must be taken into account. Yet, researchers cannot deny human involvement in shaping the more or less regular forms; scientific proof cannot thoroughly explain these phenomena. For this reason, the legends continue and the rock formations have been connected with the supernatural.